Yes, Ireland’s police and defence forces are watching over a US troop carrier at Shannon. 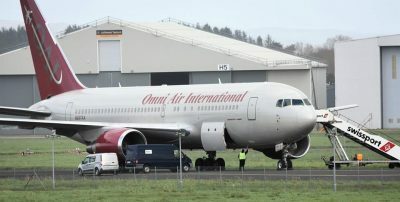 The Omni Air plane arrived on 18 Feb from Colorado Springs. The city is home to both Army and Air Force bases. There are six military installations there; five of them border the city, to the north, south and east, and Schriever Air Force Baseis located east of the city in El Paso County. One of these, Peterson Air Force Base shares an airfield with the adjacent Colorado Springs Municipal Airport. It is home to the North American Aerospace Defense Command (NORAD), the Air Force Space Command headquarters, and United States Northern Command (USNORTHCOM) headquarters. Shannon must also be feeling a bit like home to many US military personnel. They spend quite a lot of time there.